Owned by the Long Beach Area Council Boy Scouts of America and located in the San Bernardino Mountains, the 640-acre Camp Tahquitz annually serves approximately 16,000 Scouts from the Southern California area. Since opening in 1959, the camp has specialized in providing Scouts with the "finest possible camping experience" in a setting with both rolling green meadows and thick forests of cedars, oaks, and pines (including some of the world’s tallest Ponderosa Pine trees). Located at 6,500 feet elevation, the camp offers many spectacular views of the mountains above and the valley below as well as an abundant variety of birds, mammals and other wildlife. At the camp, Scouts are able to partake in a wide variety of outdoor activities, such as archery, rifle shooting, canoeing, climbing, nature studies and horseback riding. Since Highway 38 bisects the camp, Scouts were required to cross the dangerously busy highway in order to participate in activities located throughout the camp. After four years of planning and fundraising, the camp raised $350,000 in order to build a safe pedestrian crossing. 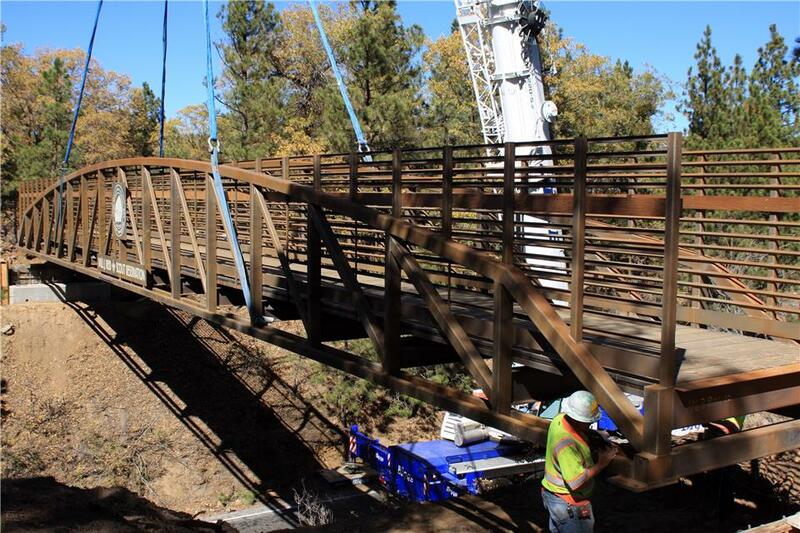 As a solution, a 100' x 8' Connector®-style, Continental® truss bridge with Douglas Fir decking was installed in just one day providing the Scouts with safe passage over the busy highway below. Exhibiting an extremely generous spirit, two firms, Prime Source Consulting and Moffatt & Nichol donated design time while the contractor, Powell Constructors, donated its time and labor during installation of the bridge. "Caltrans is excited to make our roadways safer," stated Terri Kalinga, Public Affairs Chief with Caltrans District 8. "In this case for pedestrians and equestrians." Scouts cross the highway approximately 15-20,000 times annually making the installation of a safe crossing imperative. The installation of the bridge also allowed for the removal of a crosswalk across Highway 38. "We have this bridge so that our kids are not going to be in danger while crossing the highway; it's a good day on our mountain," concluded Andy Hale, Scout Master with Camp Tahquitz.